"Religion and Politics: The Magazine"
The Cluster of Excellence “Religion and Politics” introduces the wealth of its research in a new format: “Religion and Politics. 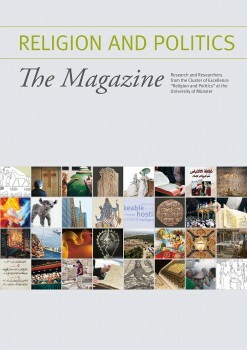 The Magazine” presents in richly illustrated reports, interviews, portraits, and essays the research and the researchers connected over the past few years to the interdisciplinary network of the Westfälische Wilhelms-Universität Münster (WWU). The contributions show the changing relationship between religion and politics, as well as law, economics, the media and art, from antiquity to the present day. “Drawing on a variety of examples, we offer glimpses into the adventure of scholarly discovery to which the scholars of the Cluster of Excellence devote themselves day in, day out”, write the speakers of the network, the sociologist of religion Detlef Pollack and the historian Barbara Stollberg-Rilinger, in their editorial. The spectrum of contributions ranges from the religious-political ambitions of “Black Pharaohs” in ancient Egypt to the political strategies of religions today; from images of the transcendent in Judaism and Christianity to the tolerance of ambiguity in Islam; from the role of music in Hinduism to the relationship of Buddhism to violence. “Religion and Politics: The Magazine” is available for free download on the website in German and English. The printed version is available from the Centre for Research Communication (religionundpolitik@uni-muenster.de). Original news of the Cluster of Excellence "Religion and Politics"
Homepage Cluster of Excellence "Religion and Politics"